After picking off Walton Hill near Birmingham on the way to Shropshire yesterday, today's plan was to visit the four southerly Marilyns in Shropshire starting with Titterstone Clee Hill. 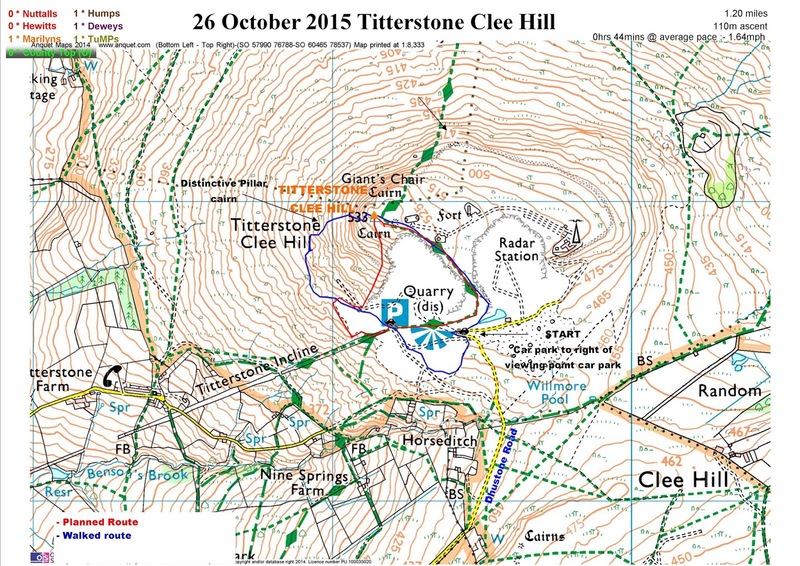 That was the plan, but after Titterstone Clee Hill I noticed Beacon Hill nearby just on the other side of the Welsh border. Decided to do this one next before returning to do Burrow and View Edge in the afternoon. Surprise surprise ran out of daylight to do any more, but in all honesty it was a good one to get out of the way as it was fairly isolated and would have needed a special journey in the future to bag this isolated peak. As a bonus I also bagged the two nearby Dewey's, but quite why that should be a bonus I am not sure as I am not really working on that list. Walton Hill summit directly in front of bench. The Clent Hills are situated on the SW corner of Birmingham. 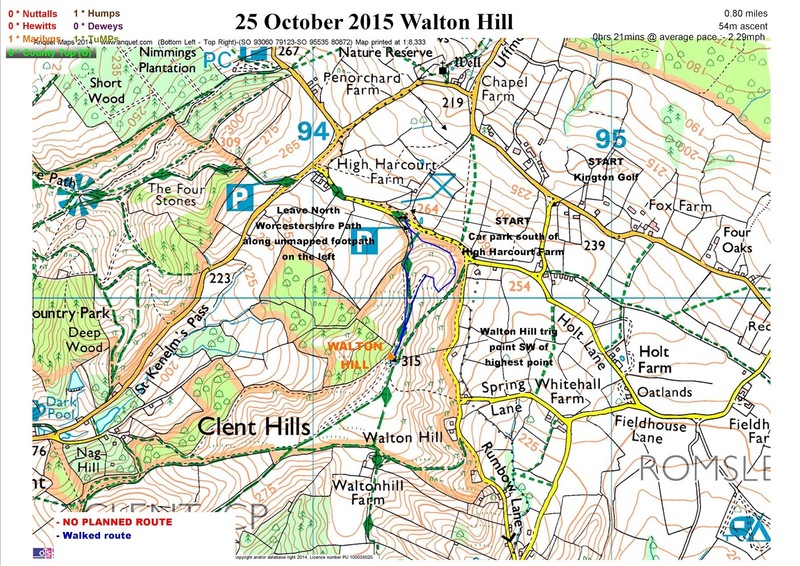 Walton Hill is the highest point and really the only major hill in the area. Did not realise there was such wonderful countryside so close to Birmingham. If I lived in Birmingham it would be enough to make me head for the hills. Unfortunately though after finding these hills it would not be enough to make me head for Birmingham. Anyway suffice it to say it is one of only five Marilyns in Area 39 and as I had already visited the other four had to be visited to give me my first area completion. If I had wanted I could have made it a longer walk by including the likes of The Four Stones and Romsley Hill in the route, both of which are on the North Worcestershire Path and both are minor TUMPs (one list that is definitely NOT on my radar to complete), I also wanted to arrive in Shropshire at a reasonable time so was happy enough to concoct a circular route rather than just nipping up from the car park to the trig and back down the same way. As mentioned earlier, I had planned for this to be the first of the four South Shropshire Marilyns to be visited today. Properly rested and recovered from the first trip earlier this month I was still in rehab mode so the milestone for this walk would be first ascent above 500m during this phase of recovery. Hence finding a parking spot as close to the summit as permissible, then following the Shropshire Way past the NATS radar station then on to the trig and summit. The path continuing to the west seduced me in to heading that way rather turning round and going back the way I came or south through heather and round the top edge of the quarry back to the van. Probably risky in fog. It did add a bit on to the walk and resulted in me having to contour round the SW corner of the hill through heather as the path refused to head south in the direction I wanted to go, but adding a few yards on to a walk that was only just over a mile did not tax me too much physically, just a bit embarrassing that the track log showed I did not take the best route. All in the name of recording a circular walk. Murkey old day heading towards Pool Hill from Beacon Hill. 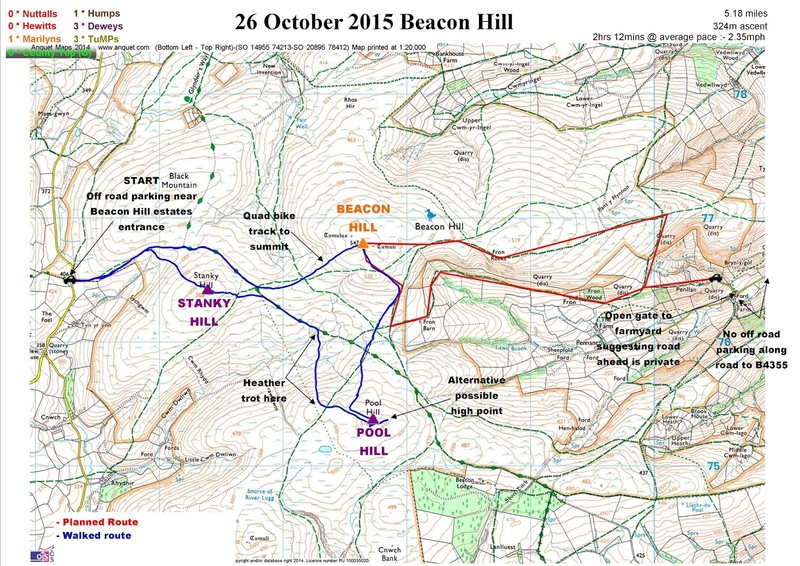 I was going to concentrate on South Shropshire Marilyns today but spotted isolated Marilyn, Beacon Hill in area 31B: Welshpool to Hay-on-Wye after visiting Titterstone Clee Hill. Decided to do this one next before returning to do rest; Burrow, View Edge and Callow Hill which never happened in the end. Took longer than planned as no parking on east side (I didn't feel comfortable leaving van near unattended Lawn Farm without asking permission) resulting in about 45-60 minute drive around to road on west side. Turns out to be the best place to park, plus managed to pull in 2 extra Deweys - Pool & Stankley Hill. Not targeting this list but could not resist as they were so close!!!!! Surprise surprise ran out of daylight to do any more, but really pleased to have got my tick against this isolated hill as well as managing my first multi hill walk, further progression and another milestone within my rehab programme. It seems official, my enforced absence from the Nuttall trail has reintroduced me to the idea of visiting Marilyns. The idea of visiting all 1550 in England, Wales & Scotland, something only done by three other people at time of writing, seems an impossible task. Well maybe it is especially as I want to complete the Nuttalls first and than on to the Munros. Well the impossibility of the task is what makes it attractive. Having only just completed the first 150 earlier this month after 7 years, the next strawberry sized bite of this elephant will be to see how long it takes to do the 2nd 150 the plan is before the end of 2016. Fail to plan - plan to fail.